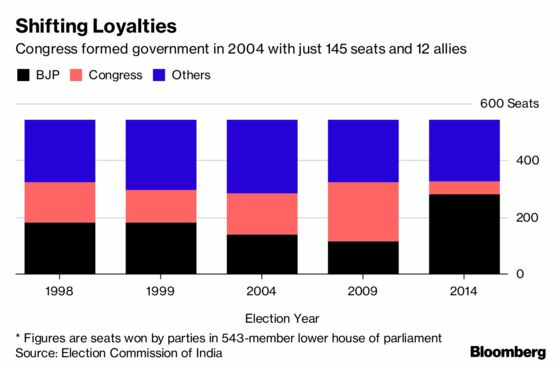 (Bloomberg) -- The era of India’s coalition politics is back, and that could spell trouble for Prime Minister Narendra Modi. With his popularity receding, polls show that Modi’s ruling Bharatiya Janata Party may fall short of a full majority in next year’s federal election. That has prompted the country’s disparate opposition parties to put aside their ideological differences and unite. A key test of these new partnerships will come Friday when Modi’s government faces the first no-confidence vote in parliament for any India administration in 15 years. While his ruling coalition is expected to easily defeat the motion, the outcome may signal whether the opposition is starting to attract more smaller and non-aligned parties needed to unseat Modi. “What is important is to see how many votes each side gets and which side has more cracks -- the opposition or ruling coalition,” said Arati Jerath, a New Delhi-based author and political analyst. The federal election due by next year will determine whether Modi extends business-friendly policies he put in place after the 2014 vote, when his party won the largest majority in three decades. While economic growth initially surged after his victory, it took a hit after he banned 86 percent of the country’s currency in a bid to stamp out unaccounted wealth in 2016, and has only recently recovered. Voter concerns have also grown due to the chaotic implementation of a nationwide goods and services tax, along with a banking credit crisis and growing discontent in rural areas. Rising oil prices are also stoking concerns that inflation will quicken. The Congress Party, led by Rahul Gandhi, has already reached an understanding with other opposition parties for India-wide cooperation, and it’s now working with small regional parties to build state-specific coalitions, said Congress leaders familiar with the development. The party is negotiating with regional leaders in up to a dozen states to improve its lowest ever performance at the 2014 election and block BJP from retaining power, said the leaders, who asked not to be identified as they are not authorized to speak to the media. Gandhi used the vote’s accompanying debate to challenge Modi on what he said were failed economic, defense and foreign policies. In a speech, amid yelling by both sides of the house, he alleged the government was close to India’s business tycoons and had failed to create enough jobs. And there was some drama too, as he walked across the chamber to hug the prime minister at the end of his address. For the moment, Modi holds the upper hand. His National Democratic Alliance holds 314 seats in parliament, far more than the roughly 270 votes he needs to survive the no-confidence motion. Yet winning anything less than that would signal further trouble in the months ahead. Modi’s bloc has already lost two key members: the Telugu Desam Party in Andhra Pradesh and the People’s Democratic Party in Kashmir. Those defections and other losses brought the NDA’s presence in the 543-member lower house of parliament to below 60 percent, according to Eurasia Group. Still, BJP leaders said the no-confidence motion will provide an opportunity to expose the opposition’s continued weakness. “We are hopeful that we will get support from parties outside NDA as well,” Ananth Kumar, parliamentary affairs minister, told reporters on Wednesday. Analysts will be watching to see if other members of Modi’s bloc voice discontent with his administration, abstain or vote against him. Shiv Sena, the second-biggest party in Modi’s coalition, was undecided on whether it would support him. On the opposition side, the question will be how many parties join Congress in voting against Modi rather than just abstaining. Ultimately they are looking to replicate the model after the May elections in the southern state of Karnataka: While Modi’s BJP emerged as the single largest party, it was ousted by a last-minute coalition cobbled together by the Congress party and a regional party. Congress is working to forge coalitions in at least 10 states, including larger ones like Bihar and Maharashtra, the party leaders said. They said the party is in talks with Mayawati, leader of the Bahujan Samaj Party, for an alliance in Uttar Pradesh, Madhya Pradesh and Chhattisgarh -- states that account for about 16 percent of total seats. Mayawati is talking to Congress about an alliance and she will take the final decision, said Satish Chandra Misra, a senior BSP leader. Modi’s electoral standing has reduced in key states because of discontent by farmers and Dalits within the ruling party, Harish Ramaswamy, a political analyst and professor of political science at Karnatak University, said by phone. “As no grouping is getting close to a majority, pre-poll alliances are becoming more inevitable,” Ramaswamy said. “The strategy of opposition parties is not to concentrate on their votes, their seats -- but to destroy votes of BJP."